Minister Hoffman with Andrea Robertson and other staff from STARS. STARS has launched an effort to replace its aging fleet, as the organization’s BK117s have been designated legacy aircraft. It is difficult to find replacement parts for them and keep them maintained. A new $13-million Airbus H145 will reduce training and maintenance costs and enhance pilot, patient and practitioner safety. 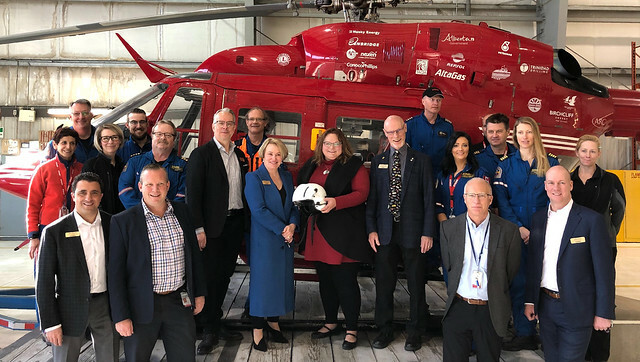 The first chopper in the new medically equipped Airbus H145 fleet is expected to arrive this spring and will be staffed by critical care paramedics, nurse paramedics and emergency physicians. In Alberta, STARS flew more than 1,450 missions last year from bases in Calgary, Edmonton and Grande Prairie. STARS has flown more than 40,000 missions since 1985. STARS operates under an affiliation agreement with Alberta Health Services.